Finally my sites are up again. A few days ago Holdfire decided to change their nameservers with only about a 30 min notice on Twitter. I was taking one of my breaks from the internet so I could watch anime so of course I didn’t see this. When I got online on the 24th none of my sites were working, and then I saw the notice. So I went on GoDaddy and updated the DNS info for all my domains, and some of my sites still were down. Two of them, actually, black-cello.org, and tokyoblue.org. Black-cello hosts Amber’s fls, and Tokyoblue hosts my anime ones. But all the domains would point to were a cPanel Great Success! page and cPanel 404 pages. Holdfire wasn’t the most helpful and wouldn’t directly answer any of my questions. Like when I submitted a ticket about it all they said was if I didn’t have a backup they could restore for me, I’d have to readd all my cPanel accounts and files. Then I got banned from the server for a while for downloading too many files something about too many connections, I’ve never had that prob at any other host before, and I’ve downloaded whole directories. But they said that it seemed that was the bulk of the problem I was having, and that I’d just have to make sure not to make more than 150 connections to the server. Once again completely ignoring my other question about the domains not working. I deleted black-cello.org and tried to readd it like they told me to, but it wouldn’t. Every time I did it said it wasn’t pointing to this hosts IP, and it said a different IP every time. After several times in a row I got it to add, but it still wouldn’t work so I deleted it again and started the process once more, the same thing happening each time. For some reason ns1.holdfire.net and ns2.holdfire.net weren’t working for those domains. So I switched them to GoDaddy’s parking and changed them back. Still wouldn’t work. I’ve been thinking about switching to Shark Space, Web Hosting Buzz, or Fanst. I have uptime monitors on the first two, and I’ve used the last one before so I know it has great uptime. The only problem is I don’t have a lot of money to spend, and Shark Space and WHB both cost more than HF/FS do and I’d have to have a regular hosting account not a reseller. Those are really expensive on the first too, and Fanst doesn’t even off that or cPanel. The final and biggest issue with switching now is time. My account here needs to be paid for between early and mid April, and it’s probably going to be the end of March before I am able to get a Visa gift card. That doesn’t leave much time to get things up and checked. I’ve lost a lot of files before doing quick host changes, and I don’t want to do that again. I really don’t know what to do. I’ll see how the monitors check out before I make a decision. On an unrelated note for some reason I’ve not only started getting a lot more spam at my fl email account, Google’s have a lot more trouble catching it. I can’t tell you how many Viagra and Meds emails I’ve deleted from my inbox that should have been easy to catch. One thing I’ve always loved about Gmail is what a good spam catcher it is. Haven’t seen this problem with my main account. And how many times can I say problem in one post? Took this test a few days ago. 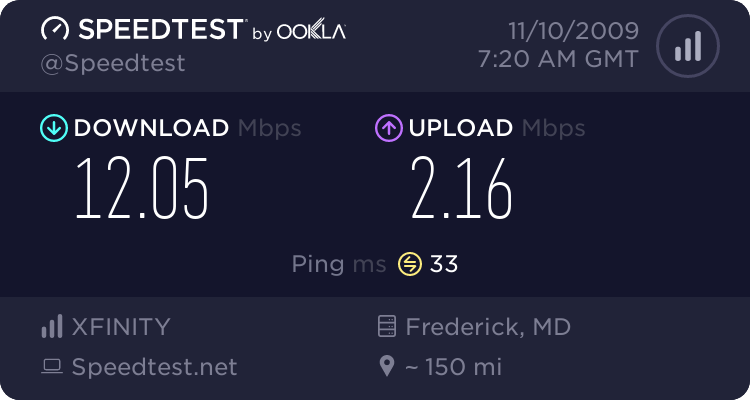 There was a post on AOST about it, so I looked up my internet’s speed stats on Speedtest.net. What idiots rated Comcast 3.4/5? I gave them one star. I checked in lower in both state and nation ISP tests. My internet speed varies a lot. Somtimes when I download a large MKV file my internet cuts out and usually doesn’t start working again until I restart the computer. I don’t know if it’s a problem with Comcast, Firefox, or the computer, because then I get an error when I try to open task manager. I expected Japan to be number one but I was wrong. Korea is beating Japan right now with download speeds 22.08/16.20, and Lithuania (huh?) is beating Japan in upload speeds with 9.04/7.27. The United States is ranked 29 and 31.